There are 2 cat videos tagged with bathtub. Original Title: Maylo the Cat vs Shark !!!!!FUNNY!!!!!LOL!!!!! Maylo does not like the shark that is swimming around in his bathtub. 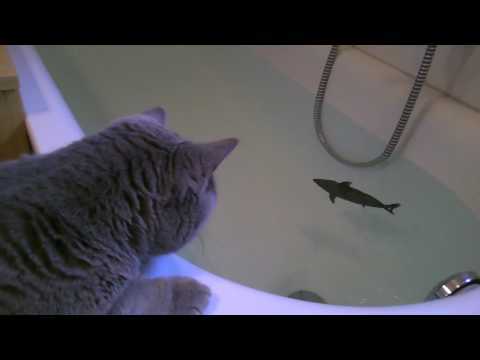 The adorable British Shorthair cat is at first confused by the remote control shark but eventually gets brave enough to try and go fishing. 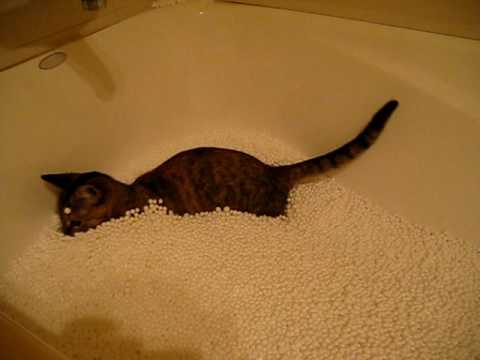 The lesson learned in this video for this cat is that if you pee on the bean bag chair, you'll get to play with the filling in the bathtub—sounds like a good deal! The owner says that the cat did not eat any of the filling so she did not get sick. And sad for the cat, she's no longer allowed near the bean bag.